Spending quality time together as a couple can be difficult, but it's incredibly important for maintaining a healthy marriage! Whether you have been married for five days, five years, or a lifetime, a little God time is the ultimate way to begin or end your day together. 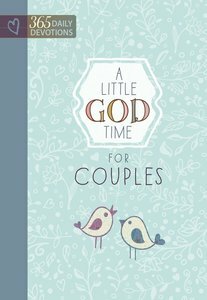 About "Little God Time For Couples, A: 365 Daily Devotions (365 Daily Devotions Series)"
Customer Reviews For "Little God Time For Couples, A: 365 Daily Devotions (365 Daily Devotions Series)"
This devotional is great for husbands and wives, it's a way to share God's love with each other. It helps couples to make time for each other, even a couple of minutes each day. Quality time together is important and this devotional is a great way to start and finish the day. I recommend this book for all couples. This book may be small in size, but looks can be deceiving- It is jam packed with a whole lot of LOVE, Gods love. I bought this with the intention to encourage my husband and I to begin each day with Gods word, and it is now a part of our morning ritual-reading a short scripture, a devotional and asking us relevant questions which we enjoy pondering over while we sip our first coffee of the day. Some of the entries have illuminated areas of our relationship, challenged us and reminded us of what our love represents within our home, the world and Gods kingdom. I even Skype him the daily devotionals when he is away. A beautiful book to reignite your Love of eachother and that of God in our Lord Jesus.